When does a plague of insects become a healthy snack? When locusts descend on earth. Free food! When Egyptian skies darkened with tiny whirring creatures bound for tender field crops, Israeli farmers went on high alert to ward off the cloud of locusts heading north. Foodies, on the other hand, recalled that chef Moshe Basson served locust several years ago at Eucalyptus, his high-end Jerusalem restaurant, as part of a special Biblical feast. Why not exploit the food falling from the sky? Especially as these locusts are kosher and halal. Old-time bars used to serve pretzels and hard-boiled eggs to encourage drinkers to order more beer. With the sudden abundance of free, high-protein food, it seems logical that Middle Eastern eateries should offer the locust as a crunchy, salty snack. At home, instead of offering the family junk food poured out of an obnoxious plastic bag, consider a bowlful of yummy fried locusts. You can season them any way you like. Locusts are an ecologically-logical. There are no greenhouse emissions involved in raising them, because they’re not raised, they’re foraged. They’re much healthier alternative to industrially produced junk snacks. No packaging to fill up landfills, and it comes in a convenient bite size. Not to mention how much cheaper a kilo of locusts is, compared to the same weight of, say, potato chips. Can’t get cheaper than free. We asked Moshe Basson for advice. How does one cook locusts? Fried, stewed, cooked into soup? And what taste do they have? We asked how to lower the, well, the eeeuw factor. “They’re more appetizing if you pull off the head, the short legs, and wings. The long legs are relatively plump, like chicken legs,” said Basson. Have ready about 2 liters of vegetable stock with a little turmeric added to it. Throw the locusts in the boiling stock, whole. Cook for about 3 minutes. Drain the locusts and let them cool somewhat. Twist off their heads: this will also pull out the black, threadlike viscera. Remove the wings and small legs. Make a seasoned flour with 4 tablespoons any flour, 3/4 teaspoon salt, a little pepper and chili powder, a shake of ground coriander, and dried garlic granules. Roll the precooked locusts in a beaten whole egg, then roll them in the seasoned flour. Shake excess flour off. Fry in olive oil for 1 1/2-2 minutes, till color turns golden brown. Alternately, use prepared “shnitzel” crumbs, or fry in tempura batter. Serve with a lemony tahini sauce, or a za’atar pesto made more lemony than usual. Convinced? Good. But we are obliged to report two problems with serving locusts. First, you’ll probably have to tell your family a fat lie and claim it’s something else, or they probably won’t eat it. Second, Israel’s agriculture ministry has sprayed insecticides on the little creatures. So by this time, the cloud of edible visitors has succumbed to a cloud of toxins. 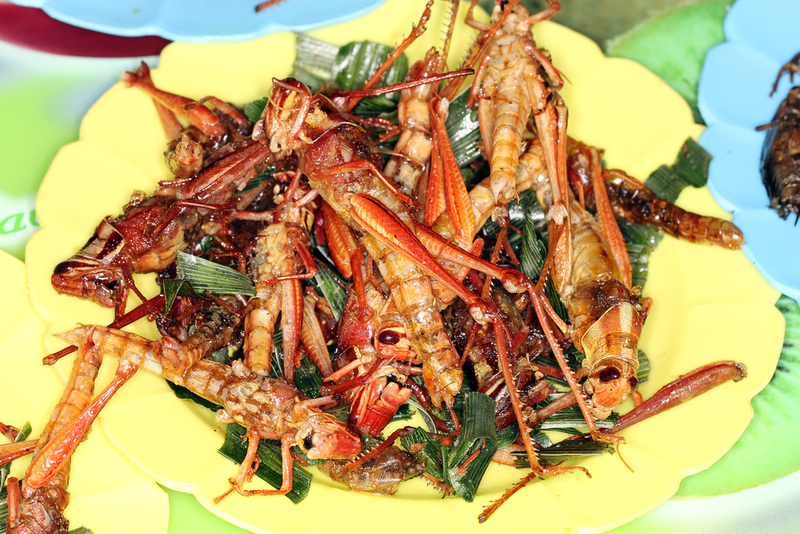 Image of fried grasshoppers via Shutterstock. there is much to read and learn online and in books. 3. Know your areas of four weeks journey you are taking, one which has a great deal concerning you actually and The scene before the reddleman’s eyes was a gradual series of ascents from the level of the road backward into the heart of the heath. It embraced hillocks, pits, ridges, acclivities, one behind the other, till all was finished by a high hill cutting against the still light sky. The traveller’s eye hovered about these things for a time, and finally settled upon one noteworthy object up there. It was a barrow. This bossy projection of earth above its natural level occupied the loftiest ground of the loneliest height that the heath contained. Although from the vale it appeared but as a wart on an Atlantean brow, its actual bulk was great. It formed the pole and axis of this heathery world.